The SL Class has standard front seat tall, head-protecting side-impact airbags, which act as a forgiving barrier between the passengers and the door. Combined with high-strength steel door beams this system increases protection from broadside collisions. The F430 doesn't offer side-impact airbags or side airbag protection for the head. Using vehicle speed sensors, smart airbags in the SL Class deploy with different levels of force or don’t deploy at all to help better protect passengers of all sizes in different collisions. The F430’s airbags don’t have smart features and will always deploy full force. The SL Class offers an optional Parktronic™ to help warn drivers about vehicles, pedestrians or other obstacles behind or in front of their vehicle. This collision warning system uses radar to detect obstacles behind the rear bumper. The F430 doesn’t offer a rear collision sensor. The SL Class has standard Tele Aid, which uses a global positioning satellite (GPS) receiver and a cellular system to get driving directions, remotely unlock your doors if you lock your keys in, help track down your vehicle if it’s stolen or send emergency personnel to the scene if any airbags deploy. The F430 doesn’t offer a GPS response system, only a navigation computer with no live response for emergencies. Both the SL Class and the F430 have standard driver and passenger frontal airbags, front seatbelt pretensioners, four-wheel antilock brakes, traction control and electronic stability systems to prevent skidding. The Mercedes SL Class weighs 869 to 1358 pounds more than the Ferrari F430. The NHTSA advises that heavier cars are much safer in collisions than their significantly lighter counterparts. The SL Class comes with a full 4 year/50,000 mile basic warranty, which covers the entire car. The F430’s 3 year/100,000 mile basic warranty expires 1 year sooner. The SL Class’ corrosion warranty is 1 year longer than the F430’s (4 vs. 3 years). 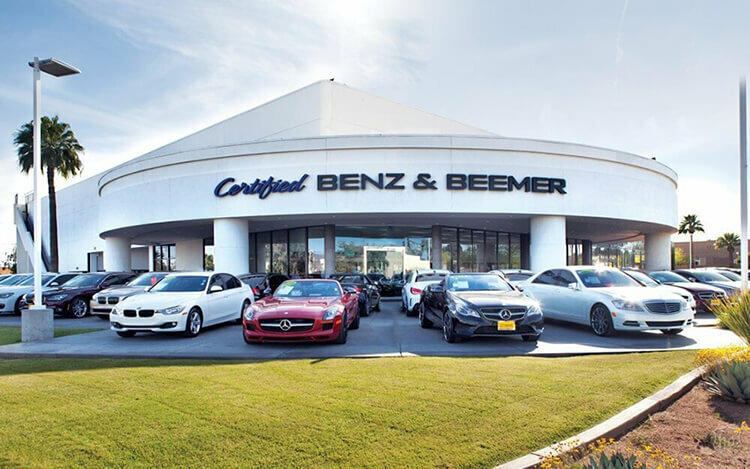 There are over 12 times as many Mercedes dealers as there are Ferrari dealers, which makes it much easier to get service under the SL Class’ warranty. The F430’s redline is at 8500 RPM, which causes more engine wear, and a greater chance of a catastrophic engine failure. The SL Class has a 5950 to 6500 RPM redline. J.D. Power and Associates rated the SL Class third among premium sporty cars in their 2006 Initial Quality Study. The F430 isn’t in the top three in its category. The SL550’s standard 5.5 DOHC V8 produces 48 lbs.-ft. more torque (391 vs. 343) than the F430’s 4.3 DOHC V8. The SL55 AMG’s standard 5.4 supercharged V8 produces 27 more horsepower (510 vs. 483) and 188 lbs.-ft. more torque (531 vs. 343) than the F430’s 4.3 DOHC V8. The SL600’s standard 5.5 turbo V12 produces 27 more horsepower (510 vs. 483) and 269 lbs.-ft. more torque (612 vs. 343) than the F430’s 4.3 DOHC V8. The SL65 AMG’s standard 6.0 turbo V12 produces 121 more horsepower (604 vs. 483) and 395 lbs.-ft. more torque (738 vs. 343) than the F430’s 4.3 DOHC V8. On the EPA test cycle the SL550 gets better fuel mileage than the F430 SMG (14 city/22 hwy vs. 12 city/17 hwy). An engine control system, which can shut down half of the engine’s cylinders, helps improve the SL Class V12’s fuel efficiency. The F430 doesn’t offer a system that can shut down part of the engine. In an emergency stopping situation, many drivers don’t press the brakes with enough force to stop the vehicle in the shortest distance. The SL Class has standard Brake Assist to detect emergency braking situations (by how hard and how quickly the brake pedal is pressed) and then automatically apply maximum braking immediately in order to help prevent a collision. The F430 doesn’t offer a brake assist feature. For better traction, the SL Class has larger front tires than the F430 (F:255/40R18 & R:285/35R18 vs. F:225/35R19 & R:285/35R19). The SL55/SL65’s 285/30R19 rear tires provide better handling because they have a lower 30 series profile (height to width ratio), which provides a stiffer sidewall than the F430’s 35 series tires. The SL Class has a standard tire pressure monitoring system, which will alert the driver to a drop in tire pressure before damage to the tire or an accident might occur. The F430 doesn’t offer a low tire pressure warning system. Changing a flat tire near traffic can be dangerous and inconvenient. The run-flat tires available on the SL Class can be driven up to 50 miles without any air pressure, allowing you to drive to a service station for a repair. The F430 doesn’t offer run-flat tires. The SL Class offers an available adjustable active suspension system, which counteracts cornering forces actively, limiting body roll and improving handling and stability. Ferrari doesn’t offer an active suspension on the F430. The SL Class has a standard automatic front and rear load leveling suspension to keep ride height level with a heavy load or when towing. The F430 doesn’t offer a load leveling suspension. The SL65 AMG handles at .93 G’s, while the F430 Spider pulls only .92 G’s of cornering force in a Car and Driver skidpad test. The SL Class’ standard power retractable hardtop allows a seamless transition from an open car, to a completely sealed coupe. The F430 doesn't offer a retractable hardtop. The SL Class has 5.8 cubic feet more passenger volume than the F430 (57.8 vs. 52). The SL Class’ entire steering wheel hub sounds the horn, facilitating hitting the horn in an emergency. The F430 has two small spoke buttons. These buttons can be hard to reach in an emergency. When three different drivers share the SL Class, the memory system makes it convenient for all three. Each keyless remote activates different, customized memories for the driver and front passenger’s seat positions, steering wheel position, seatbelt height, outside mirror angle and climate settings. The F430 doesn’t offer a memory system. The SL Class’ power windows raise and lower automatically with one touch, especially convenient at tollbooths or drive-up windows. The power windows on the F430 don’t raise automatically. The SL Class’ standard power window controls are mounted on the armrest for easy access. The F430’s available power window controls are spread out on the center console where they can’t be seen without the driver completely removing his eyes from the road. If the windows are left down on the SL Class the driver can raise them all using the keyless remote (remote must be aimed at door sensor); on a hot day the driver can lower the windows. The driver of the F430 can only operate the windows from inside the vehicle, with the ignition on. The SL Class’ rain-sensitive wipers adjust their speed and turn on and off automatically based on the amount of rainfall on the windshield. This allows the driver to concentrate on driving without constantly adjusting the wipers. The F430’s manually variable intermittent wipers have to be constantly adjusted. Heated windshield washer nozzles are standard on the SL Class to prevent washer fluid and nozzles from freezing and help continue to keep the windshield clear in sub-freezing temperatures. The F430 doesn’t offer heated windshield washer nozzles. The rear window of the SL Class is glass, so that it won’t become hard to see through with age. The plastic rear window on the F430 Spider will become opaque with age and scratches. In poor weather, headlights can lose their effectiveness as grime builds up on their lenses. This can reduce visibility without the driver realizing. The SL Class has standard headlight washers to keep headlight output high. The F430 doesn’t offer headlight washers. To help drivers see further while navigating curves, the SL Class offers optional adaptive headlights to illuminate around corners automatically by reading vehicle speed and steering wheel angle. The F430 doesn’t offer cornering lights. The SL Class’ standard heated front seats keep the driver and front passenger extremely comfortable in the winter. The F430 doesn’t offer heated seats. The SL Class’ optional air conditioned front seats cool the driver and front passenger and help take the sting out of hot leather in Summer. The F430 doesn’t offer air conditioned front seats. The SL Class’ standard dual zone air conditioning allows the driver and front passenger to choose two completely different temperatures so people with different temperature preferences won’t have to compromise. This makes both the driver and front passenger as comfortable as possible. The F430 doesn’t offer dual zone air conditioning. To keep a safe, consistent following distance, the SL Class offers an optional Distronic, which alters the speed of the vehicle without driver intervention. This allows the driver to use cruise control more safely without constantly having to disengage it when approaching slower traffic. The F430 doesn’t offer an adaptive cruise control. To help keep the driver’s hands on the wheel, the SL Class has standard steering wheel controls for the radio. The F430 doesn’t offer steering wheel audio controls. With optional voice command, the SL Class offers the driver hands free control of the radio and cell phone by simply speaking. The F430 doesn’t offer a voice control system.